We loved our stay at the Happy Inn Lodge. Interlaken is pretty small so the location was perfect, just a quick walk to anywhere in town. Beds were so comfy and clean and the bathrooms were spotless as well. We only stayed one night but were able to use the luggage storage until our train left on Sunday night. It was raining all afternoon on Sunday so we decided to eat and have a few drinks at the restaurant, they let us stay at our table for a few hours before our train also! Great place!! The location was perfect and my trip to Switzerland could not have been better. The best part about this hostel was the friendly staff! We booked a double room, which was huge and great value. Bathrooms were always clean, great waterpressure in the shower! The downstairs restaurant/bar was always lively, we had a great meal there, best ribs I've had in ages and awesome local beer. Bit pricey.. but on par with the rest of Switzerland! Staff were all really friendly, recommended good local beers to drink and such! No laundry facilities but these are highlighted on a map given to us on check in. Would definitely go back! Amazing location, it is very loud since there is a bar underneath. small room but good facilities (they have a rice cooker!) and in a good location. 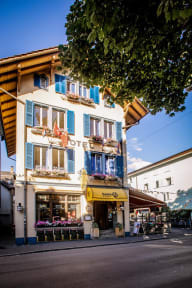 The location was great, only a 4 minute walk to Interlaken West Station and 20 minute walk to Interlaken OST. They also give you a discount card that lets you ride the buses in Interlaken for free! The staff was really helpful in helping us plan certain parts of our trip and even let us use the phone when our data wasn't working. There is also a kitchen and luggage room you can use even after you check out if you don't want to carry your luggage around. This business appeared to be bar first, hostel second. Loud music played every night (including Sunday) past midnight. The kitchen had no burners or oven. The room itself and bathrooms were fine and exceptionally clean, but I'd rather pay the extra few bucks to stay at a place where I can't hear music blasting even with ear plugs in. Hostel was a good value for your money, but it is right above a bar so very loud at night. Kitchen facilities only include a microwave so not ideal, and in the rooms there is a plug in on each bed to charge your phone, but mine was broken, so I wasn’t able to use my individual light or charge my phone for next day use :( staff was kind and helpful.